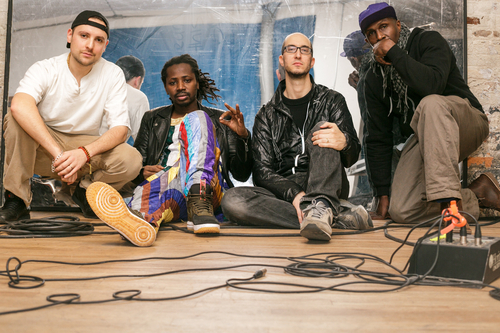 The new collaborative project Sélébéyone takes the conversation between jazz and hip hop to “feverish new heights” (The WIRE), drawing from Senegalese Rap, French Spectral Music, Modern Jazz, Underground Hip-Hop, Interactive Electronic and beyond. Composer and saxophonist Steve Lehman leads the international ensemble, which features HPrizm (vocals, English), Gaston Bandimic (vocals, Wolof), Maciek Lasserre (sax/electronics), Carlos Homs (keyboards), Chris Tordini (bass) and Damion Reid (drum set). The trailblazing, Grammy-nominated jazz pianist and composer Vijay Iyer joins forces with an all-star ensemble of equally brilliant, inventive, and musically multilingual performer/composers Himanshu Suri (formerly of Das Racist), guitarist Rafiq Bhatia (Son Lux) and drummer/rapper Kassa Overall for a voyage across multiple musical landscapes, articulated by the individual brilliance of the four collaborators. Pakistani vocalist/composer Arooj Aftab will join Thums Up and also perform a set of her own songs with Leo Genovese, piano; Jorn Bielfeldt, drums; and Yusuke Yamamoto, synths. Jazz trumpet virtuoso Ambrose Akinmusire, hailed by PopMatters as “one of the very best musicians in jazz–or any other style of music,” joins post-modern rapper Kool A.D., known for his “social consciousness infused irreverence” (Colorlines), for the premiere of a new chamber work that pushes the boundaries of jazz and hip hop. Guided by Akinmusire’s “strong aesthetic compass” (The New York Times), this uniquely explorative and expressive world premiere collaboration will feature the “fearless, precise and forward-looking” (The Chicago Reader) Mivos Quartet alongside pianist Sam Harris and drummer Marcus Gilmore.